​Having an iPad available at all times makes sketching and recording ideas easy. At one time I disliked digital art but the more I use it commercially, I see many fine art uses for it too. It doesn't create the work for you and having a traditional background certainly makes the work stonger. ​I completed this painting of a Hudson Valley waterfall in time for the annual exhibit.. It has a very organic quality due to the poured water effect resulting in a peaceful work. I also showed some digital illustrations I completed for a couple of children's books . Being able to create art in a variety of media keeps it exciting and interesting. the bi-annual plein air paint-out and auction. The day was dreary, rainy and cold so I painted the scene with added memories of prior days. This is my painting from the 2014 Olana: Landscape within a Landscape event to benefit the Olana Partnership and the CCCA. This year was a challenge due to weather conditions but I was there at 7AM to catch the sunrise. Th winning bidder for this work had stopped by Olana for the day, saw me painting it and came back the next day to bid at the auction and win it! One of my paintings included in the 2014 Marist College Faculty Art exhibition. The birdhouse is located in Rhinebeck, NY at the Delamater House. I donated this small painting to the Barrett Art Center in Poughkeepsie, NY for a fundraiser to continue programs and exhibits at the center. This is a small barn nearby on Rt. 52, that I've passed for years, it's the tree that finally got my attention. As an artist member of Edward Hopper House I was invited to exhibit six paintings for the month of August. Hanging my artwork in the home of one of my artistic influences was an honor. 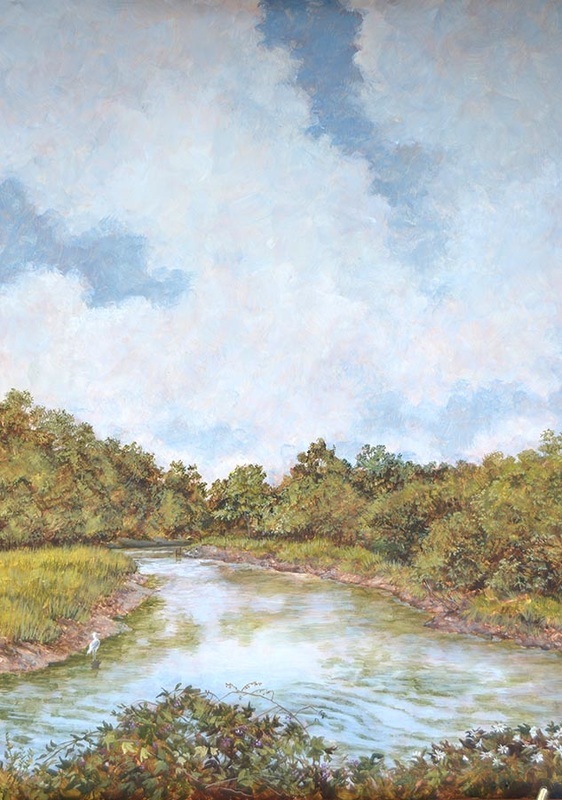 ​The Olana Plein Air Artists On Location 2013 event was a great success. I focused my view away from the front entrance towards the lower hills and mountains beyond. The day was perfect for color and light. 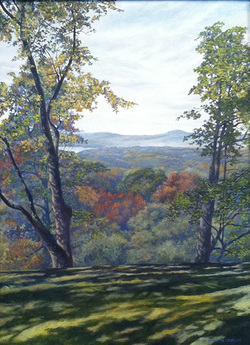 "Top Of The Morning" captures the scene from the top of Olana at about 9a.m. with all of the majestic splendor Frederic Church had in mind. This painting tied for the Peoples Choice Award at the following viewing and auction. It is always a privilege to paint in this great location and to connect with Hudson River artists past and present. "I recently participated in the Rye Arts Center Painters On Location event and wound up painting at the Coveleigh Club in Rye. It was an overcast. cold day and the pool/beach area was dotted with fire pits. I decided to paint the view from the shore when I overheard a conversation about how members were singing karaoke around the fire pits till late the previous night. 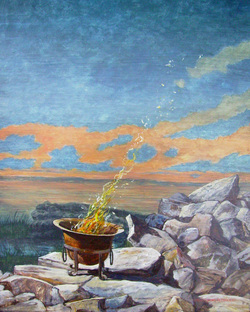 I decided to place one of those fire pits on the rocks and painted the sky as I'd seen it earlier that morning. Not the typical auction painting but "Coveleigh Karaoke" certainly captures the feeling". 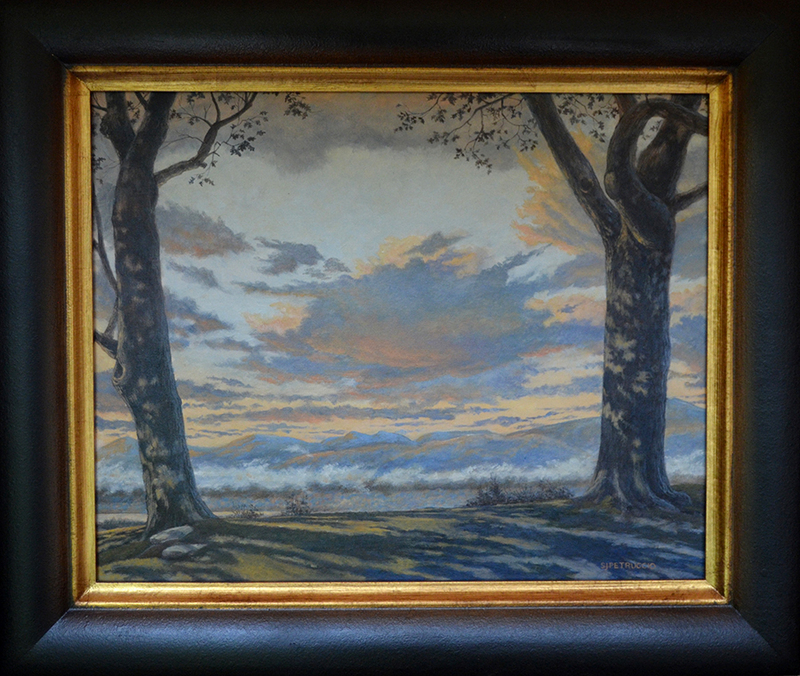 Steven James Petruccio's painting, "Olana Oak" was the recipient of the First Place prize at the first plein air painting event and auction at Olana, the home of Frederic Edwin Church. Mr. Petruccio was selected, by a jury process, to be one of thirty-one artists invited to paint on the grounds of Olana over a three day period. One of the paintings, created during two and a half days of actual painting, was then offered for auction. Steven's painting of the large oak tree in front of the main residence was unique among the many panoramic landscapes and indicative of his focus on individual elements in his paintings. "Olana Oak" brought in the third highest price in a successful event that raised funds for educational programs.